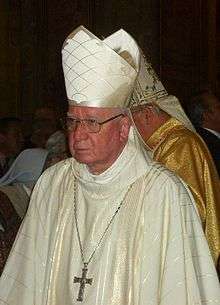 Pro-Grand Chancellor of the Catholic University from 1974 to 1985, he was named titular bishop of Thibilis and auxiliary bishop of Rancagua on December 18, 1984. Medina was consecrated to the episcopate on January 6, 1985 by Pope John Paul II himself, with Cardinals Eduardo Martínez Somalo and Duraisamy Simon Lourdusamy acting as co-consecrators. He was made Bishop of Rancagua on November 25, 1987 and then Bishop of Valparaíso on April 16, 1993. He was appointed Pro-Prefect of the Congregation for Divine Worship and the Discipline of the Sacraments on June 21, 1996, resigning from his post in Valparaíso on the same day. 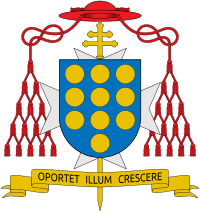 He is also a chaplain ad honorem of the Sovereign Military Order of Malta. ↑ The other two cardinals were the protopriest Stephen Kim Sou-hwan and the most senior Cardinal-Bishop and Sub-Dean of the College of Cardinals Angelo Sodano. In addition, nine non-cardinals made the public act of homage. The nine non-cardinals were: Bishop Andrea Erba the bishop of Benedict's former suburbicarian diocese of Velletri-Segni; Father Enrico Pomili the priest serving as pastor of Benedict's former titular church Santa Maria Consolatrice al Tiburtino when he was a Cardinal priest; a deacon; a religious brother; a Benedictine nun; a married couple from Korea; and a young woman from Sri Lanka and a young man from the Democratic Republic of the Congo, each of whom had been recently confirmed. 1 2 Ceremony of Papal Inauguration of Pope Benedict XVI [24.04.2005] on YouTube Retrieved 12 April 2013. Wikimedia Commons has media related to Jorge Medina Estévez. Cardinal Jorge Medina Estévez announces Cardinal Joseph Ratzinger (Benedict XVI) as the new Pope on YouTube.